Sony’s Play Station Portable now supports RSS feeds. The real news here is for podcasters. 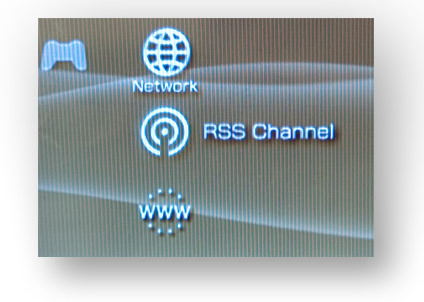 Because the PSP has a built in wireless connection, and because of the way Sony has configured the RSS function, the PSP is now essentially a streaming audio player. I’ve been walking around my home office listening to podcasts on my PSP, streamed from Internet RSS feeds. No need to store them when I can listen to them wirelessly. Pretty neat feature… which lead me to discover that you can team up the PSP with TVersity on your PC and stream away! Have you managed to get CBC Radio 2 streaming to the PSP? If so, how? Thanks in advance.